Dundonald Links, in North Ayrshire, Scotland, will host the Aberdeen Asset Management Scottish Open for the first time in 2017. Located near the town of Irvine, Dundonald Links – which is undergoing major renovation works – will follow on from Castle Stuart Golf Links, the host venue for the 34th edition of Scotland’s national Open from July 7-10, 2016. “Special thanks goes to our two partners in the Scottish Open – the title sponsors Aberdeen Asset Management, and the Scottish Government – whose joint vision and commitment to improve and expand this great tournament has enabled us to make this announcement today. 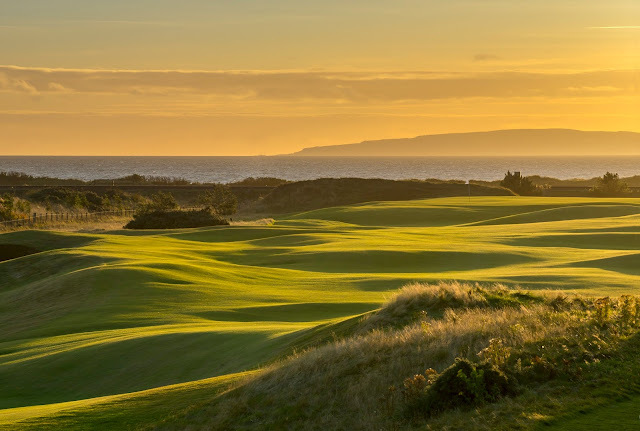 Malcolm Roughead, Chief Executive of VisitScotland, which manages the Scottish Government’s investment in the event, said: “Scotland is the Home of Golf, and as such is fortunate to have an abundance of world-class golfing venues the length and breadth of the country. Bill Donald, General Manager of Loch Lomond Golf Club and Dundonald Links, said: “The course changes will enhance what was already a fantastic spectator experience, with natural amphitheatres surrounding many of the holes. “Crowds of ten thousand turned up for the Ladies Scottish Open last year, and we’re hoping for more of the same this year. Broadcasters around the world will be covering the final day of the tournament live, and I am sure that anyone who tunes in will be impressed with what they see. Councillor Willie Gibson, Leader of North Ayrshire Council, said: “North Ayrshire Council is delighted to welcome the Aberdeen Asset Management Scottish Open to Dundonald Links in 2017. Words by Aberdeen Asset Management Scottish Open.